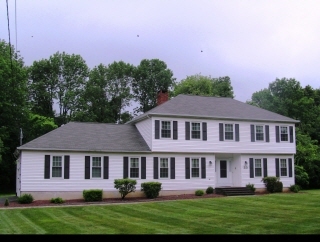 This beautiful, level, private, tranquil property is the perfect setting for this spacious CHC nestled in Randolph. A generous sized foyer & hallway w/gleaming hdwd, lead the way throughout this well maintained property. Fabulous updated kitchen w/wood cabinetry, granite counters, SS appliances. Formal DR, generous sized LR & Fam Rm w/wood burning fireplace & sliders that lead to the large trex deck, sets the stage for entertaining. Hdwd flrs throughout. Four spacious bdrms & 2 full baths on the 2nd floor. Newer hot water heater, garage doors, windows, front door & sidelights, paver front porch, steps & walkway, kitchen & baths, add to the appeal. Convenient location for major commuter routes, shopping, parks, Randolph Trails & NYC transportation. Walking distance to Post Office, drug store and Pizza!